The Pioneer Valley is a hub for the creative arts. It’s a place where many musicians, artists, performers, and creatives come to gain inspiration for their work and to find an artistic community where they can thrive. This is not only true for adults, but for children and teens as well. There are many opportunities in the Valley for kids to follow their artistic intuitions and to gain experience working as a team to create something wonderful. One opportunity in particular is right here in Franklin County, specifically in Charlemont. Since 2010, the Hilltown Youth Performing Arts Programs has been running their Hilltown Youth Theatre Summer Workshop. Their mission is to build a supportive community for youth to develop personally and artistically and to train and collaborate on theatrical productions at a high level, therefore giving them an appreciation for hilltown life and a passion for the arts. This program, for youth aged 10-18 years old, is an intensive arts experience for aspiring actors, musicians, dancers, and set designers. Guest artists and master teachers, direct participants to create performances which incorporate movement, puppets, mask making, voice work, circus arts, and work on large apparatus such as stilts, aerial fabrics, spools, flying trapeze, and more. At the end of the workshop, the performance takes to the streets, or rather the mountains for audiences to enjoy. 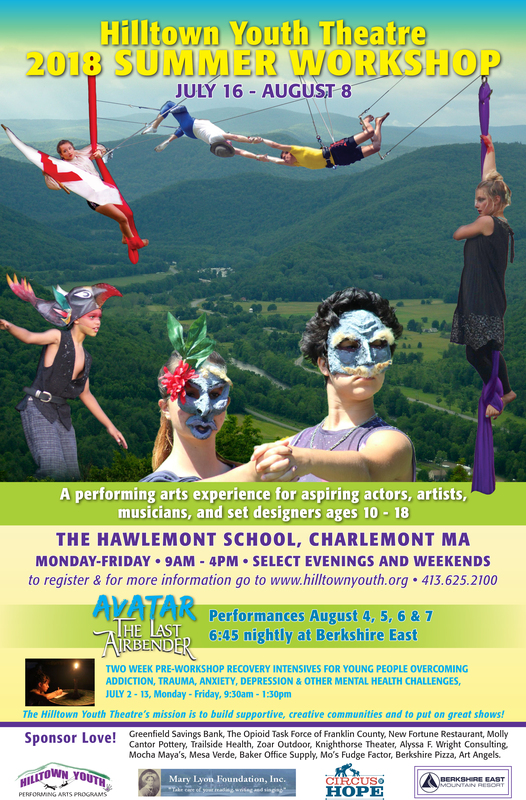 This year’s production of Avatar: The Last Airbender will be hosted by Berkshire East Mountain Resort in Charlemont. The 2018 Summer Workshop runs from July 16 to August 8, Monday through Friday, 9 am to 4 pm. Registration is open now and financial assistance is available. No previous experience is necessary but the ideal candidates will be artists, musicians, athletes, or any other active creative types. For more information, visit their website here.